I’m sorry, you can no longer win $15,000 by reading this book. It was the announcement of the solution to the 10 cipher challenges, located in the back of The Code Book, that made me aware of this book. 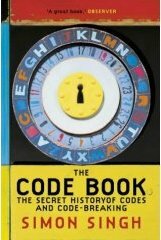 Money aside, if you are interested in learning of the history of codes and ciphers, this book is for you! Did you know that Mary Queens of Scots was killed by Queen Elizabeth, because her code was not strong enough to foil the code breakers of the time. I really wish I had ran into this book before I purchased my “utility” sewing machine. I got a no frills home machine with a few stitches. It was a floor model, but I would have been better to spend the money on a light weight industrial sewing machine with only a straight stitch. Louise was talking about me when she mentioned those who buy a machine with all of these cool stitches. I have just finished building my first rear wheel using The Bicycle Wheel as a guide. This book will teach you the technical aspects of the bicycle wheel in both structural principles and practical methods. After a couple hundred miles on my new wheel, it is still true as an arrow. This book debunks myths and gives you the confidence to repair, build, and rebuild wheels. I can honestly say that I no longer fear any wheel repairs.